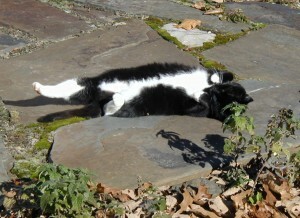 On a warm and sunny day I caught this little kitty enjoying a roll on the flagstone. She had been nibbling the catnip that you can see in the foreground. Catnip keeps this feline entertained on a sunny day. Photo taken 12Nov2010. The perennial roots will keep catnip here for a long time. New sprouts will pop up in the adjacent areas as old sticks die back. Next Spring new growth will arise near the old growth. Some of the stems can be quite woody, especially near the base. 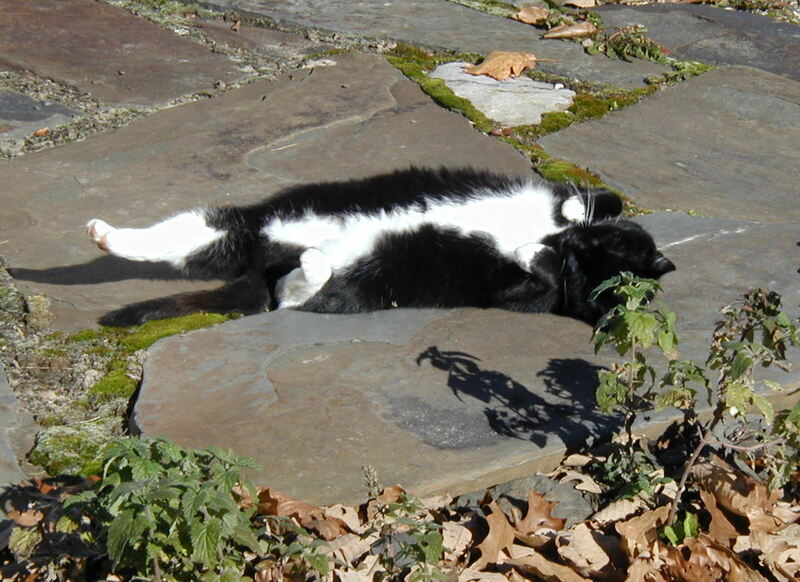 We like having catnip planted near the house. I don’t know if it acts to deter insects, but it does keep the felines close by. We really appreciate knowing that we won’t be bothered by mice or other rodents with our cat hunters nearby.